It is largely a greenfields nation as far as electronic health records is concerned, which gives it a great opportunity to make bold and innovative decisions, avoiding many of the pitfalls of those who have gone before and the constraints of legacy systems. The national program has set up CENTERMS – the national centre for Terminology and is using Ocean’s Clinical Knowledge Manager as a key tool to manage the national infostructure. You’ll notice the phrase is INFOstructure, not infrastructure like most other EHR approaches. Their premise is that standardisation of the information models and terminology value sets will provide a strategic component of the final EHR solution that will outlast any single technology, messaging paradigm or implementation trend, and underpin every eHealth use case, from EHRs to messages, population health queries, research, big data aggregation and knowledge-based decision support. 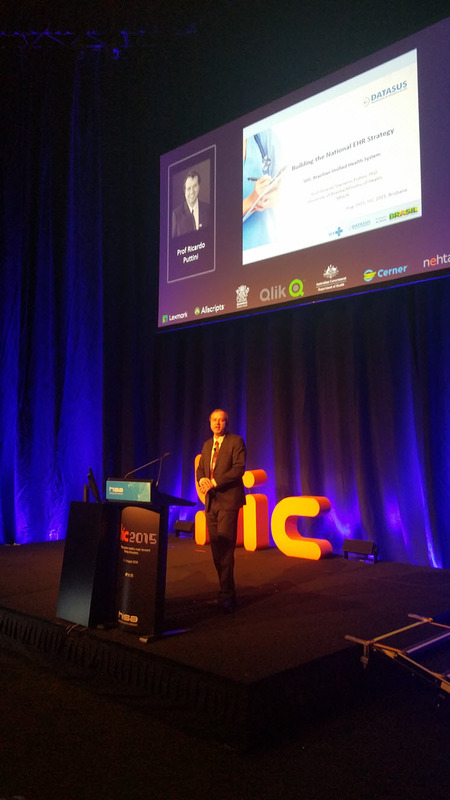 Last week, Professor Ricardo Puttini, as Brazilian MoH EHR program lead gave a keynote address, including openEHR at the centre of Brazil’s infostructure program, at Australia’s healthIT conference, HIC2015. Next week, at Medinfo, Ricardo Puttini and Dr Jussara Rotsch, plus Australia’s Heather Grain and myself will be conducting a workshop to explain the Brazilian approach: “Practical Use of Terminologies with Clinical Information Models workshop” on Saturday August 22 at 11.30 hours, Room 9. Come say hello if you’ll be in Sao Paulo next week! 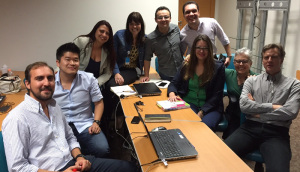 openEHR training session last week at Hospital Sirio Libanes, one of the premiere teaching and research hospitals in Brazil. I delivered the background and theory part, Samuel Frade and Bostjan Lah (both from Marand) delivered the programming part. We were there at the invitation of Beatriz de Fario Leao (no introduction needed there). Met a great team of business analysts and developers, some in the above photo. Looking forward to working more with them. Brazil is starting to work a lot with openEHR, and may become one of the premier locations using it. Which would be great – a large country moving to a semantic, model-based technology for the EHR and interoperability. This entry was posted in eHealth, Health Informatics and tagged archetype, centerms, CKM, infostructure, snomed, terminology by Heather Leslie. Bookmark the permalink. Indeed, your link to the courses are welcome. I, too, was trying to draw attention to the considerable openEHR momentum building in Brazil at the moment, and on a variety of fronts. I think we might be on the cusp of some exciting eHealth developments here. Sure, Heather!! We took some time to make the EHR standards cusp to emerge, but it is now going through a mighty growth. In 2011 the Ministry of Health published a decision to adopt in the future 12 standards for health information, among them openEHR (the others being HL7, EN 13606, SNOMED-CT, IHE PIX and PDQ, CDA, DICOM, ICPC 2+, LOINC, etc.). We are involved in all this, particularly focusing on education, which is going to be the Great Lever. And you will be part of this effort, thanks to Jussara, Marivan, Ricardo and others. Hope to meet you at MEDINFO 2015 in São Paulo! Brazil is moving toward structured data and terminologies are key reference on fostering EHR implementation. OpenEHR fits perfectly to this moment. Education and Training are mandatory. HL7 Brazil Institute promotes EHR standards as well provides better understanding for interoperability with legacy national systems.